Pantone has announced their color for 2016. It is the first time that two colors have been selected. In laymans terms – baby blue and pastel pink. Don’t know that I am crazy about either one of these becoming the decorating rage. Categories: home decor, Uncategorized | Tags: @properties, grayslake real estate, gurnee housing market, home decor, kieron quane, lake county illinois real estate, libertyville homes, paint colors, pantone, staging, terri & kieron team, terri and kieron team, vernon hills homes | Permalink. Plenty of people disagree with me and believe instead that holiday decorations increase the risk of offending someone. In over 20 years of selling real estate, I have never had a buyer be offended by holiday decorations. Instead, the decorated homes tend to appear a bit more welcoming, and warmer – which is an added bonus during a Chicago winter! Just keep the decor tasteful. Simple. Soft. Tone it down from your typical annual display. Garlands on a staircase, garnished with twinkling lights. A lightly staged mantled, dressed with stockings and candles. The Christmas tree, tucked in the corner or filling the oft empty space of a bay window. And do not forget the entry. Especially if you are in a cold climate where a buyer will be standing, looking around, while the agent fidgets with opening the lockbox. Again, keep it simple. Want some ideas? 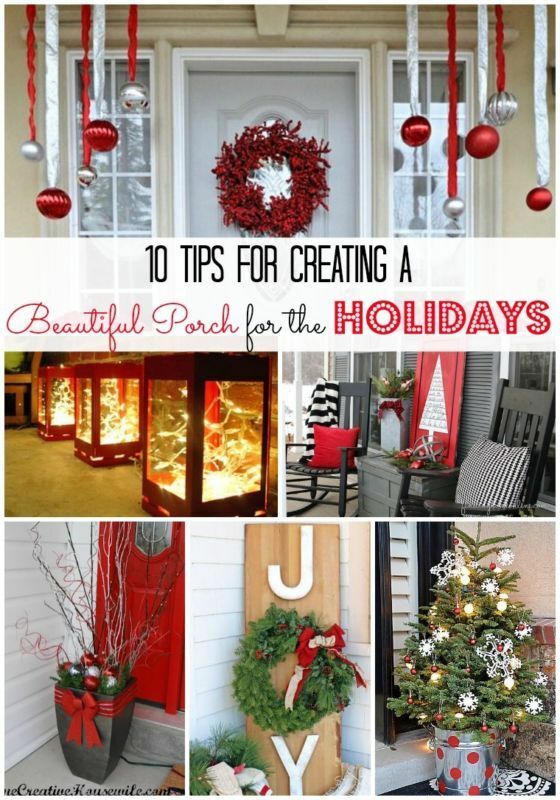 Check out this post from tatertots & jello, offering 10 tips for a terrific porch display. Happy Holidays! Categories: home decor, real estate, selling a home, staging tips | Tags: christmas, decorating, grayslake housing market, gurnee housing market, gurnee real estate, holidays, home decor, home staging, lake county real estate, libertyville homes, porch, selling my home, staging tips, terri & kieron team, terri and kieron team, vernon hills homes | Permalink. Wow! Never have I thought that the prospect of laundry could be a wonderful thing. I think I would do tons of it just to spend time in these rooms! Check out our pinterest link by clicking on the picture below. There are over 100 great ideas for jazzing up your laundry room – no matter the size! Creative decorating examples: from lighting to paint colors, wall decor to flooring type, window treatments to counter tops – there are so ways to turn a laundry room into a pleasant hub of your home! Now comes the hard part – deciding where to start! Categories: home decor | Tags: decorating, decorating solutions, grayslake real estate, gurnee real estate, home decor, home decorating trends, home improvement, homeownership, lake county illinois homes, laundry, laundry room, libertyville real estate, preparing your home to sell, realtors, remax suburban, staging tips, terri and kieron team | Permalink. Ahhhhh…the holiday season is quickly approaching. For some people, that means spending extra time in the kitchen – or worse yet, having lots of guests spend extra time in your kitchen. In the world of real estate, the kitchen is generally the center of the home. It tends to be a major focal point of buyers, and it usually is the most expensive room in the house. And the room that we spend the most time in. Not only to prepare and eat meals, it also serves as a homework space, hobby nook, home office and entertainment hub. Have you ever noticed how many people congregate in the kitchen, whenever you invite a group to your home? Better Homes & Garden put together 25 Tips to Get the Ultimate Kitchen. While some are a bit more extensive (& expensive) to pull off, there are also some simple ideas that can easily be completed in time for the holidays. Love your kitchen, it is such an important part of your home! What one change could you make today? Categories: home decor, real estate | Tags: decorating, grayslake homes, green oaks homes, gurnee real estate, home decor, home decorating trends, home improvement, lake county illinois homes, libertyville homes, realtors, remax suburban, terri & kieron team, terri and kieron team, vernon hills real estate | Permalink. Categories: home decor, real estate | Tags: chiberia, decorating, fireplace, grayslake housing market, gurnee real estate, home decor, home decorating trends, lake county illinois homes, libertyville real estate, realtors, remax suburban, terri & kieron team, terri and kieron team, winter | Permalink. Rare offering of a full walkout basement in Country Walk! Terrific 4 bedroom/3.1 bath home offers fantastic amenities. Located in Lake Villa Elementary/Grade District 41 & Grayslake North High School District 127. Categories: Buying a home, real estate, selling a home | Tags: buying a home, country walk, for sale, grayslake homes, grayslake north high school, grayslake real estate, gurnee real estate, home decor, home for sale, lake county illinois homes, real estate, real estate agent, realtors, remax suburban, round lake beach, terri & kieron team, terri and kieron team, thompson elementary school | Permalink. So are we! Stop by and follow our home-related boards! Categories: garden, home decor, real estate, selling a home, staging tips | Tags: decorating, decorating solutions, furniture arranging, grayslake homes, green oaks homes, gurnee real estate, home decor, home decorating trends, home staging, lake county illinois real estate, libertyville homes, preparing your home to sell, realtors, selling my home, staging tips, terri & kieron team, terri and kieron team, vernon hills real estate | Permalink.